Allergy Advice: Contains Wheat, Milk, Soy, Egg, Lactose. May contain almond and peanut. Ingredients: Wheat Flour (27%), Sugar (26%), Corn Starch Syrup (16%), Cocoa Preparation (Whole Milk Powder, Cocoa Mass), Cocoa Powder, D-Sorbitol, Glycerin, Palm Kernel Oil, Palm Stearin Oil, Glycerin Esters Of Fatty Acid, Tocopherol, Palm Oil, Beef Tallow, Refined Palm Oil, Soy Lecithin (E322 (Emulsifier)), Tocopherol, Leavening (Ammonium Bicarbonate (E503) (Acidity Regulator)), Sodium Bicarbonate (E500 (Raising Agent)), Calcium Phosphate Mono-basic (E341 (Anti-caking Agent)), Alcohol, Liquid Whole Egg, Lactose, Glucose Hydro-crystalline, Torte (Soybean Oil, D-Sorbitol, Glycerin Esters Of Fatty Acid, Alcohol, Mixed Forumuation, Water), Gelatin, Salt, Emulsifiers (Lecithin, Glycerin Esters Of Fatty Acid), Cocoa Mass, Artificial Flavours (Vanillin, Vanilla), Casein (Emulsifier, Arabic Gum, Sodium Hydroxide), Xanthan Gum. 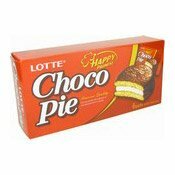 Simply enter your details below and we will send you an e-mail when “Happy Promise Choco Pie (樂天朱古力批)” is back in stock!